Ok, I have had with some of the racist postings I sometimes read in this forum. Well, that is the emotional reason for starting this thread. What I am referring to are these highly dubious arguments that go something like "folks in one race or another have higher IQs than folks of another racial background." To me, it is utterly transparent that the real reason for such arguments are to justify continuation of a hierarchical system based on race and/or ethnicity. Such arguments are as devoid of actual scientific validity as is the idea that humans are not in any way responsible for greenhouse induced climate change. Overwhelming evidence is against the premise, yet it persists. One might add that such racism is not confined to whites. India still struggles with a history of a caste system that persisted for centuries. Latin America also suffered from something like a caste system. 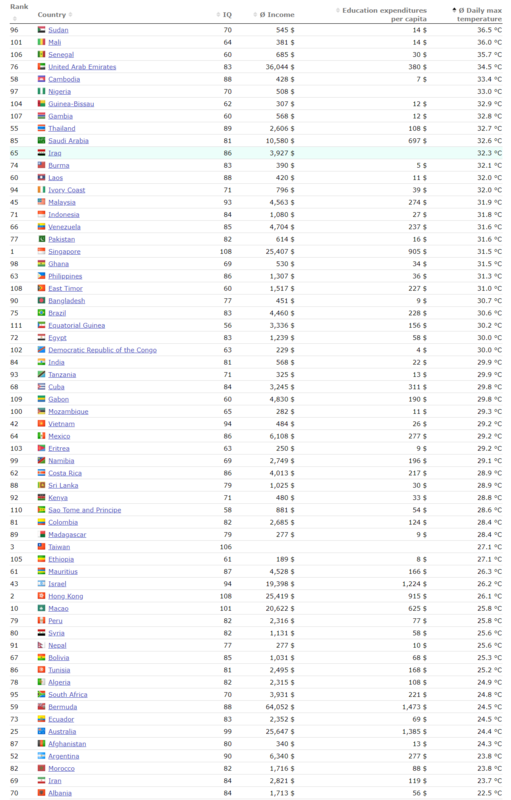 That is, immigrants from Spain were at the top. Natives of pure Spanish descent were next. Mestizos (mixed Spanish and Indian) were next. Native Indians and blacks shared the bottom rungs of their society. So I have started this thread to give folks a forum to argue these issues out. "Nature versus Nurture" refers to a more legitimate debate among scientists concerning behavioral psychology. That is, are certain behaviors the result of genetic influence, or are they the result environmental factors - such as being taught to behave a certain way. Now, one of the problems of such a debate is that it can in and of itself unintentionally promote racism. So, a few ground rules. 1) "Facts" should be supported by clear citation to appropriate sources. So none of this X race has an IQ that is 20% higher than Y race without such appropriate citation. This rule will be self-enforcing. That is to say that the absence of citation will be taken as proof that you are blowing smoke. 2) If you wish to engage in hypothetical arguments, then use examples like Wurfian characters or Star Trek aliens. Such as "Klingons might be more belligerent because..."
3) Be polite and civil to each other, particularly if your debate adversary is already following rules 1 and 2. Again, self-enforcing. People who throw rude temper tantrums tend to discredit the position they are advocating. Future BS arguments on this topic in other threads will be referred to this thread for further debate. Failure to meet me or other people here to further your arguments will be taken, at least by me, as a lack of confidence in your initial premise. For now, I do not have an opening article. I'll just say that when I see thousands of pieces of research saying iq is mostly genetic than it's pretty hard to think nurture has very much to do with it. Caltrek look at the data put out for decades coming from the sat, act, standardized test on down to national iq all suggesting the same reality. There's no erasing the reality that humanity is going to need to do gene slicing of higher genetic versions of our species in the future and that's the cold hard truth as most of our problems as an species has to do with low intelligence and inequality of ability and that's why I believe in eugenics through genetic gene slicing to fix this problem. The good thing about it is everyone wants more intelligent children and unlike 50 or 100 years ago it can be done without violating human rights. It has nothing to do with nurture outside of the fact that societies that do have lower "iq;s" tend to screw over anyone that wishes to push the boundaries and do better. That is what nurture is...The environmental effects. Do you really believe for one second that an society that has a 100+ iq on the norm and promotes higher education to all its children is going to be more restrictive to opportunity compared to one that is just trying to feed its self? I don't blame people that were born unlucky or even populations but humanity will continue to suffer until we address the reality of it. The displayed IQ was averaged out of the results of 9 international studies and compared to the average income and government expenditures on education for the years 1990 to 2010. "but scientifically proven, a warmer climate has a markedly bad influence on the intelligence quotient." I think it is unethical to ignore such realities when science could fix the problem. Researchers have previously shown that a person’s IQ is highly influenced by genetic factors, and have even identified certain genes that play a role. They’ve also shown that performance in school has genetic factors. But it’s been unclear whether the same genes that influence IQ also influence grades and test scores. In the new study, researchers at King’s College London turned to a cohort of more than 11,000 pairs of both identical and nonidentical twins born in the United Kingdom between 1994 and 1996. Rather than focus solely on IQ, as many previous studies had, the scientists analyzed 83 different traits, which had been reported on questionnaires that the twins, at age 16, and their parents filled out. The traits ranged from measures of health and overall happiness to ratings of how much each teen liked school and how hard they worked. Then, the researchers collected data on how well each individual scored on the General Certificate of Secondary Education (GCSE) exam, an exam that all students in the United Kingdom must take and which is used for admission to advanced classes or colleges. The team found nine general groups of traits that were all highly hereditary—the identical twins were more likely to share the traits than nonidentical twins—and also correlated with performance on the GCSE. Not only were traits other than intelligence correlated with GCSE scores, but these other traits also explained more than half of the total genetic basis for the test scores. In all, about 62% of the individual differences in academic achievement—at least when it came to GCSE scores—could be attributed to genetic factors, a number similar to previous studies’ findings, the team reports online today in the Proceedings of the National Academy of Sciences. "Facts" should be supported by clear citation to appropriate sources. So none of this X race has an IQ that is 20% higher than Y race without such appropriate citation. This rule will be self-enforcing. And that's where we can already stop. The personal set of "appropriate sources" depends of someone's already established worldview. Yes, there are mountains of sources confirming the fact that "X race" performs with IQ-tests much better than "Y race". But no problem, you can always dismiss them as "unappropriate". 1) Difference in IQ-test scores is long and widely known empiric fact. If some "bright and progressive" minds are still in denial, that's their own problem. 2) Still i think this rather "nurture" than "nature". The same noticeable gap exists between rural and urban Russians. In this case, it would be very strange to search for "genetic" reasons. So, the different results simply mean that people of more complex and advanced society are better trained to solve the puzzles created in complex and advanced society. Nothing else. 3) Are there any evolutionary racial differences in the way of thinking? Yes, the official science says a loud and decisive NO, even the problem statement itself is rejected as heretical. And exactly therefore official science (as being rigid, dogmatic, ideologically motivated) can not be 100% trusted. Some are going so far that declare human races the "social construct". Such a sweet and progressive idea! But should we take it seriously? Meanwhile, this - the possible subtle differences in the way of thinking and social interaction - is very interesting thing. And honest researches (if they were ever allowed) could bring us very interesting and unexpected results. For example, I've read some of so-called "afrocentric" texts claiming that Whites are too materialistic and aggressive while Asians are too sprititual and distracted from reality. And only "Black and beatiful" people are able to find the right balance. Sounds ridiculous, but what if some future "socio-antropology" will fully confirm this? What if there is something genetically hardcoded in our brain making any "white" societies prone to fast growth and collapse, and "black" societies more durable? Willn't be this the useful knowledge? I finished. Thanks for attention. The argument is not that genetics has nothing to do IQ. It is plausible to presume that biological factors do make some individuals more adept at good performance in tests of IQ than other individuals. Some of these biological factors may very well include genes. Certainly, there are IQ variations within each racial and major ethnic group. The argument comes over whether there are differences between groups, between the averages of such groups. Although the source you cite would at first seem to support your argument because of the way you presented that source, in fact support for the counterargument I am now presenting was overlooked. Intelligence is not a learning ability, but can be consciously increased. Through regular brain training like in school, individual skills are specifically addressed and achieved through a performance increase. Thus the general thinking-ability can be influenced by each individual within a certain framework. The IQ was developed by West Europeans for West Europeans according to West European standards. It is still debatable whether this procedure can be applied to people(s) with entirely different social structures, cultures, values and ways of thinking. 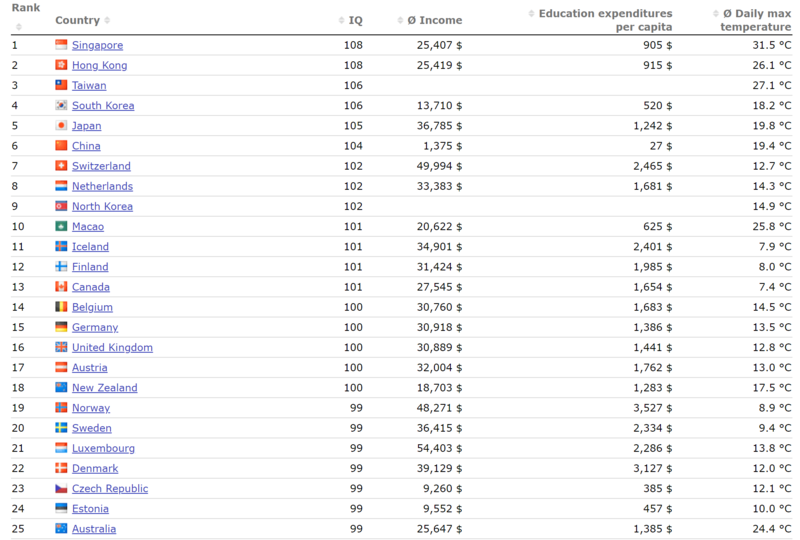 On the other hand, countries with high education expenditures almost always have an intelligent population. The reversing circuit is not always true, because among the first 30 places there are also countries with medium to low educational expenditures. The leading countries of this ranking are exclusively the most developed East Asian countries. In these countries it is usual for the families to invest in education of their children and not for the government. The educational expenses are not less than elsewhere - but not caused or payed by any government. There is also a discussion of whether intelligence is influenced by climate. Climate as a cause of differences (leaving aside possible impact on inherited traits) would be in the nurture column of causes. Whether intelligence can be impacted by genetic engineering is a little off point in regards to intelligence and race. Whether future societies pursue that course is an interesting question. I'll always remember the story that was shared where one of the Amazon tribes (I think it was the Huaorani) were receiving dental care from a dentist that had come in from elsewhere. They brought in a portable chair made of some kind of lightweight wood, and the equipment was solar powered. Anyway, they wanted the dentist to train them how to do it, but he refused, stating that it was too complicated. Well, he was working on this one guy's tooth and one of the tribes people was watching him work. He went away to go fetch something, and when he came back, the tooth was fixed. And that is when he learned that even "primitive" tribes are intelligent. It's just they need to watch what the other is doing. I would also argue IQ only measures intelligence in some areas. For example, I can wax eloquent about philosophy and literature, but throw me into the Amazon jungle by myself and I'd probably be dead within a few days, if not hours. There is always something to learn from others, that is my point. I also remember vividly Steve Saint describing how as a boy among the Huaorani, he would be ridiculed when they would go hunting, and the men would say, did your father not teach you to hunt, and he would say, you killed him so how could I? But, my point in mentioning that is everyone has a skill, among other tribes, some of our skills would look silly and useless. Among others, it would look different than that. My source is Steve Saint, as he came to my former university and gave a speech where he told these stories. Climate as a cause of differences (leaving aside possible impact on inherited traits) would be in the nurture column of causes. The climatic-deterioration scenario (of why dinosaurs died - caltrek) is certainly plausible and may very well be correct. The problem is finding anything resembling proof. A well-known trap in the analysis of historical records is what the famous Oxford statistician G. Udny Yule, called the "nonsense correlation." Most things that we can measure over time are changing, be they mean temperatures on the Earth or stock-market averages or skirt lengths. Thus, if we look at any pair of such records, they are very likely to be correlated (positively or negatively): either both are going up, both going down, or one is going up and the other going down. Professor Yule used several decades of British records to show that life expectancy in the general population went up consistently as the membership in the Church of England declined. And he pointed out that it was nonsense to suggest that public health in Britain improved because of declining commitment to organized religion - or the reverse. Using "nonsense" logic, who would argue that the strong correlation between upward trends both in the incidence of lung cancer in America and the ownership of pop-up toasters indicates cause and effect? So, the observed correlation between climatic deterioration and dinosaur decline is suggestive but does not really tell us much. Source: The Nemesis Affair, David M. Raup, page 55. ^ ^ ^ Well, the good intellectual trick, allowing you to automatically dismiss any evidence threatening your worldview: "So what? Just another nonsense correlation..."
IQ tests pattern recognition. It does not test communication skills, or solid wisdom. It's sort of like Omosoap said, although I'd disagree. I think that IQ is more about the ability to adapt into new situations quickly, not about what information you know. IQ tests are much more nurture than nature for me. If it was nature, then otherwise I'd be at average arab-level 80-90 IQ instead of the super-genius ubermensch level you people know me as. My theory on why this is is because of foundational structures. If someone is able to understand, for example, basic math to a very high level, then they are able to carry on that system of thought into other situations. Testing pattern recognition is like testing the similar types of patterns you know that you can apply to the patterns you see in the exam. It's why learning things like music theory and subsequently playing an instrument increases IQ. You learn new things that you can find similarities in other pattern. I was blessed to like books, video games, education, and most of all, the internet throughout my childhood. That gave me a lot of patterns and systems of thought that I could carry onto a later age. I fully believe that a man from sub-saharan Africa has the same potential to be as intelligent as a Scandinavian, because A. they can both speak their language to a complex level and are uninhibited in that manner, and B. What incentive does a Scandinavian have to be more intelligent than an African in evolutionary terms? I made a giant rant the other day and decided not post. Instead I'm going to invalidate SR's source and put that argument to rest hopefully. This post turned into a monster. Notice that the argument the source presents is invalidated by the data the source presents. Premise: There is scientific proof that the average temperature of climates have a causal relationship with IQ. This relationship is inverse. The higher the average temperature the lower the IQ and vice versa. Assuming this is true the data should reflect it. There were 111 countries surveyed and if the claim is true, disregarding an outlier or two, the hottest countries should have the lowest IQs and the coldest countries the highest. Averages for the whole data set. The math I'm doing is verifiable with high school mathematics, please run your own numbers if you don't believe me. Let's start by sorting the data by IQ from highest IQ to lowest IQ. A few things jump out that call the premise into question. That places 4 out of 10 of the highest IQ countries in a hot climate. In the case of Singapore significantly hotter coming in at 8.9C hotter than average. Moreover the coldest countries in the top 25 highest IQ countries aren't even in the top ten. Considering that the temperature difference is so far below the average for these countries ranging from 12.6C - 15.2C. The colder countries in question should have higher IQs than the hotter countries which are ranked higher. Inconsistencies like this appear throughout the whole data set. Some choice examples are the cold but low IQ Bosnia and Herzegovina with a rank of 83), IQ of 82 and temp of 18.5C. In contrast Vietnam ranked 42) is hot at 29.2C but has a high IQ of 94. These aren't outliers that can be explained away as statistical noise because of how contradictory the data within the top 25 countries ranked by IQ is. The significantly colder European countries mentioned should have outperformed the significantly hotter Asian ones, yet they don't. 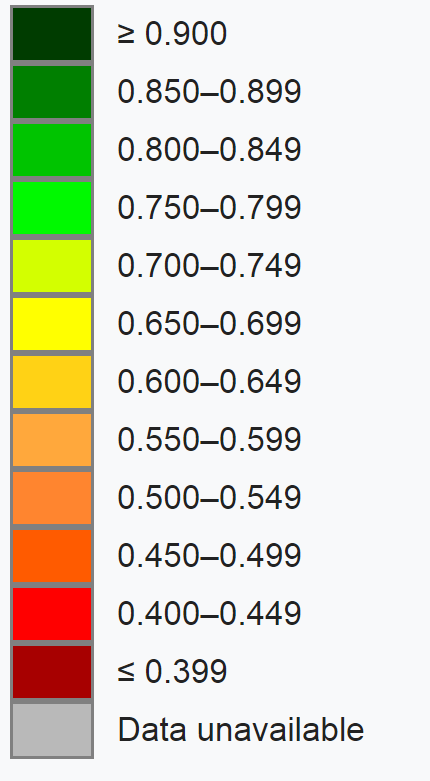 Furthermore, notice that when sorted by average temperature from lowest to highest how disconnected the IQ based ranks become compared to the temperature. I encourage you to look at the whole chart yourself on the source's website. I'm going to focus on a particularly problematic portion of the data set below to further examine this inconsistency. Below are the hot countries. 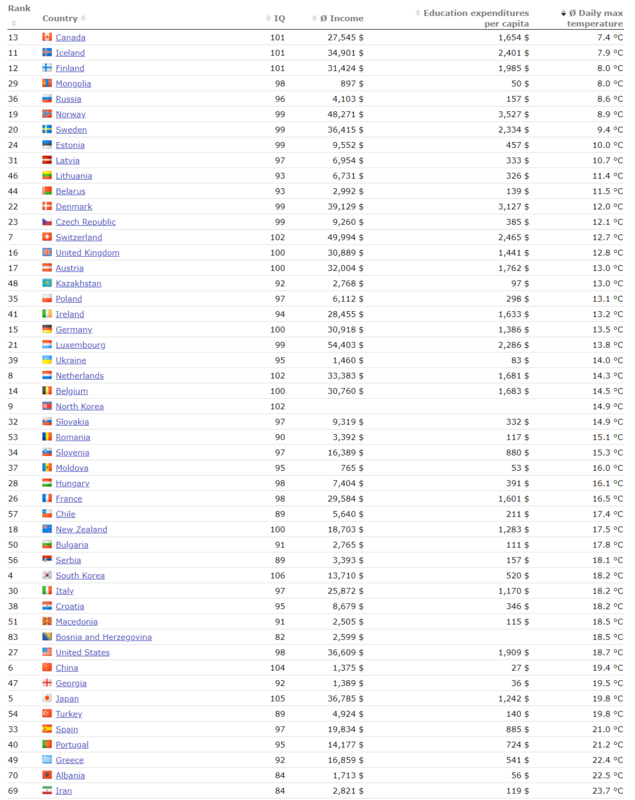 Notice how all of the countries listed are above the average global temperature. Now notice how their ranks do not correspond with the premise's claim that the hotter countries should have lower average IQs. They should be following a mostly linear progression trending towards downward trending IQs. Excluding a few outliers nearly all of these countries should have low average IQs. Out of the 62 countries with above average temperatures 15 have an average IQ higher than or equal to 87. 24.19% of the countries in question contradict the premise, that means the premise doesn't hold for nearly 1 out of every 4 cases! If some biological law dictating that hotter climates mandates lower IQs were at play, it should be observable in nearly all of the countries where data was collected. The error here is far too large to claim scientific authority, even if there were sound logic present one website cannot claim scientific authority in the same way a highly tested theory like general relativity can. And given the potential for abuse with any idea that makes claims on intelligence, extraordinary standards are required here. At least with hot countries the premise doesn't hold. Error Count = 2 This is already enough to dismantle the premise but let's keep going. Now lets look at the cold countries. Out of the 49 cold countries 47 have an IQ higher or equal to 87. That's ~ 95.91%. A 4.09% divergence isn't too bad in social science. So, at least with cold countries the premise seems to hold. Why? The premise is already proven false, temperature has no correlation, let alone a causal relationship with IQ. If it did, the data from the hot countries would have reflected that. What alternative explanation might be present? HDI statistics from a reputable source, the United Nations Development Programme. According to HDI standards any country with an HDI higher than or equal to 0.7 is considered to have a high level of human development. Out of the 48 cold countries were data is available (no North Korea) 48 have a high HDI. That's 100%! This means that low IQs are correlated with low human development. Which is to say that life expectancy, years of schooling and income may all play a role in a person's IQ. In short, poverty is the problem, not temperature. I also point out that trying to falsely claim temperature is the source of low IQs conveniently paints non-european nations as stupid seeing that the majority of the hotter nations are non-European. This only contributes to conspiratorial and racist rhetoric. Whereas there are developed non-European countries and analysis based on HDI does not face this problem. In addition the HDI based analysis is true whereas the temperature argument is fallacious. The premise is wrong, the data does not support it. Temperature does not have any correlation with IQ. The data is presented badly due to omitting easily accessible statistics that contradict the sources claim. It is unethical and unscientific to ignore data just because it contradicts one's opinion, this is flatly dishonest. There's also bad procedure at work from using countries where data could not be gathered in the premises analysis which in its own right is a bad idea if one wants to purport total scientific authority by boisterously claiming as the source does in the first paragraph, "Often surprisingly, but scientifically proven, a warmer climate has a markedly bad influence on the intelligence quotient." All the work I just did should have been done by the source's writer first and honestly presented. The website tries to pass itself off as scientific by presenting numbers and looking professional, but fails to uphold even the most basic scientific standard. Science =/= pretty numbers do stuff. There's much more rigor and reasoning involved than that. Finally, SR you can't say "I realize that some people hate hearing this and wish it would just go away but it may well be the truth. Should we really ignore reality? Or work to fix reality with science? It seems to me that evolution forced people in colder climate to have higher iq's to survive." when your claim is demonstrably false. Your claim is not backed by science. Moreover, even if it was how do you jump from "there are people with low IQs" to "people with low IQs should be exterminated through eugenics?" There's just such a breakdown in reasoning here, even if the study were true it has nothing to say about what should ethically be done, if anything. I encourage you to go back to the drawing board, learn what the scientific method means, why people think it's ethically good, and brush up on some skills. Anyone with a high school understanding of statistics could look at that source just like I did and see why it's problamatic. The statistics just stood out as wrong in relation to the premise. It took a while for me to reason out why they were wrong sure, but just looking at that data set had my intuition going that something was amiss.